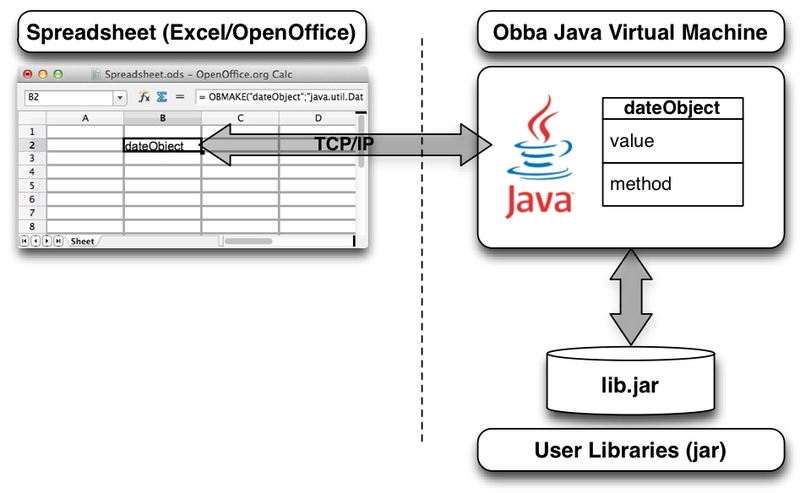 Obba: A Java Object Handler for Excel, LibreOffice and OpenOffice. 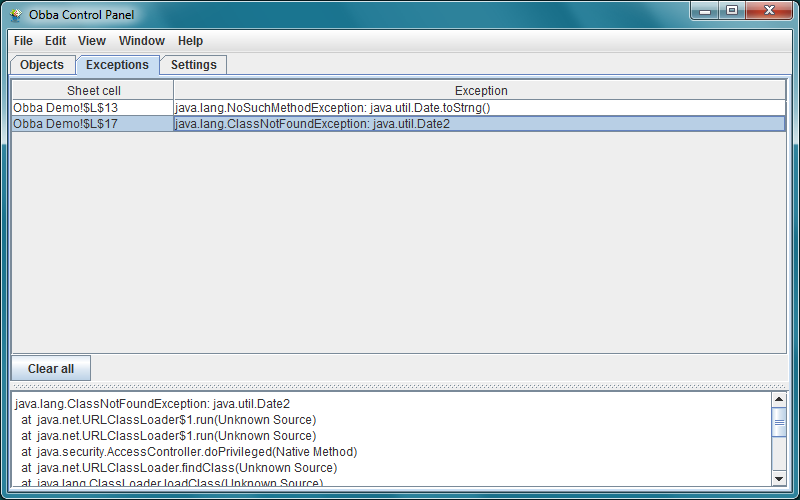 - Access Java objects and methods via spreadsheet functions (user defined functions). Obba A Java Object Handler for Excel, LibreOffice and OpenOffice. Platform independent Spreadsheet Add-Ins with Client/Server Support . Compatible with Excel/Windows, LibreOffice/Win/Mac/Linux, OpenOffice/Win/Mac/Linux, NeoOffice/Mac. Demo Movie: Creating objects dynamically from source code, see Class to Object Demo (movie). Schema of Obba Interaction: Obba provides access from the spreadsheet to objects created from classes of your library - without any additional coding. The spreadsheet and Obba JVM may run on different machines. Obba Control Panel. Object tab: showing allocated objects with creation time and last access time. Obba is different from interfaces such as XLL4J, XLW, ExcelDNA, etc. in that it requires no glue code to link the spreadsheet to the library. Objects are instantiated by their original constructor. A spreadsheet-specific factory method is not necessary. Since objects are instantiated through the Obba functions and handled by Obba handles, Obba knows the object you are referencing in your spreadsheet. This allows tracking which objects are used as well as (implicitly) their dependencies. Obba for Excel tracks the calling spreadsheet cell. If the Java execution raises an exception, Obba lists the spreadsheet cell containing the function that raised the exception in the Obba Control Panel. The Obba spreadsheet functions are available in Excel (running on Windows), in OpenOffice and LibreOffice (running on Windows, Mac OS X, Linux, etc.) and in NeoOffice (running on Mac OS X). Hence, if your external library is platform independent, your spreadsheet is platform independent too (within the platforms supported by OpenOffice, assuming that your spreadsheet does not rely on technologies other than OpenOffice, Obba and your library). Invocation of method toString (having no arguments), on the object created in cell A1, storing the result of the method under the object label dateString. Object references correspond to spreadsheet cells. Constructors are called via the obMake spreadsheet function (returns a string handle to the object reference). Methods are called via the obCall spreadsheet function (returns a string handle to the object reference of the result). The unregistered version of Obba is available at no charge as long it is neither modified nor redistributed in a modified package. The unregistered version will present a spash screen and startup is slightly delayed. We offer a regular license and a developer license on a per user basis. If you acquired a regular license, we grant the use of Obba for commercial purposes, with no right to modify or redistribute Obba. You will receive a registration key to remove the Obba splash screen. If you acquired a developer license, we grant you ("the Third Party Developer") the redistribution of Obba together with the Ice components (Ice.jar and Ice.dll) included in Obba with your own products, provided that you do not modify Obba (the class files within Obba.jar) and provided that you do not use the Ice components (Ice.jar and Ice.dll) and comply with the Ice license agreement included in Obba.zip. End users shall not be permitted to modify or distribute any part of your product(s) using Obba. You will receive a registration key to remove the Obba splash screen. Obba is provided under the terms stated in the LICENSE.txt file, distributed in the Obba.zip file. free The unregistered version may be used for an unlimited time. Note: The unregistered version starts with a splash screen, which will disappear within a few seconds. The unregistered version may not be modified or redistributed in a modified from. The regular license for commercial and/or corporate use is 29 Euro per user (technical users running Obba server), payable via PayPal. The developer license for commercial and/or corporate use is 49 Euro per developer, payable via PayPal. Note: Please retain your PayPal notification of payment as proof of purchase. Download and unzip the Obba.zip archive. Open the folder "Obba for Excel for Windows"
Open the folder "Obba for OpenOffice"
For OpenOffice on MacOS X: Due to a bug in Mac OS X / OpenOffice 4.1 the installation requires the presence of Java 6, but this is only required for the installation. For LibreOffice on MacOS X: Due to a bug in LibreOffice 4.2, 5.1, 5.2 the installation will hang if Obba.oxt is opened via "Double Click". Instead, start LibreOffice, Open Extension Manager and select "Add" to add Obba.oxt manually. Install complete! Now, try one of the demos in the Demos folder. Note: If have Obba for OpenOffice 2.x installed you need to remove it first! You cannot use the OpenOffice Updater to Update Obba 2.x to Obba 3.x. Java 1.8 Runtime or better (for Java 1.6 please use Obba 4.x: Obba 4.2.2 (legacy version)). Microsoft Windows XP or better (tested with Windows XP, Windows 7 x86 and Windows 7 x64)). Microsoft .NET Framework 4.0 (included in Windows Vista and Windows 7) (if this is missing, Microsoft offers an installer). The .Net 4.0 Client Profile is sufficient. Microsoft Excel 2000 for Windows or better (tested with Excel 2000, Excel 2007, Excel 2010, Excel 2013 (x86 and x64). Note: Obba 3.x is no longer compatible with Windows 2000 (due to the absence of a .Net 3.5 framework). Obba 4.x is no longer compatible with Windows 2000 (due to the absence of a .Net 4.0 framework). Once Obba is installed, it is available in Excel/OpenOffice after launching. For examples of how to use Obba take a look at the files in the Demos folder. We recommend that you first try out the Date Demo, which uses java.lang.Date to demonstrate object instantiation and method invocation. It also gives an example of transient object handles. Next, try the Normal Distribution Demo. It loads an external jar (here Apache's commons-math.jar) and uses a class from it to calculate the cumulative normal distribution. There are two versions of this Excel sheet: the one entitled "concurrent" invokes the calculations concurrently. When developing new sheets it is helpful to open the Obba log window. See Obba Control Panel: Windows. You may see the Obba log messages in the OS X Console application. Documentation is available online. You may also access the Obba documentation offline via the Obba control panel's "Help" menu. For a detailed version history see the release notes. Support for Java 9 and Java 10. Convenient way to construct java.time.LocalDateTime from Excel date. 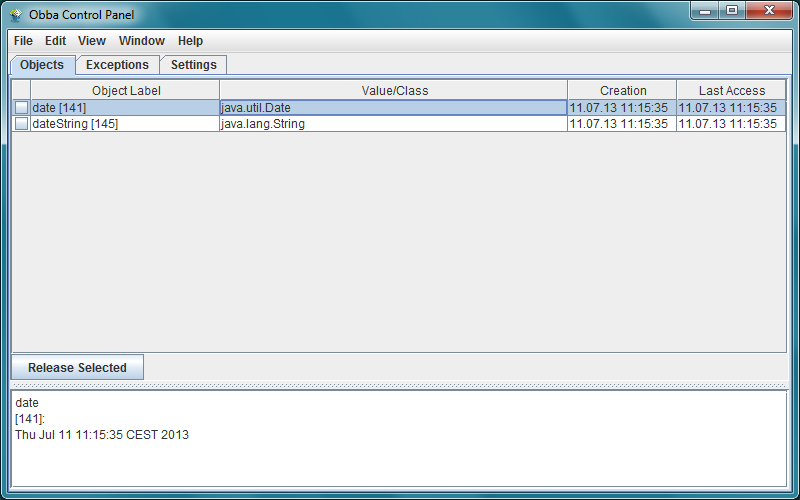 Convenient way to construct java.time.LocalDate from Excel date. Convenient way to create List objects. Improvements to the Java reflection engine. Update of core components. Use of .Net Framework 4.0 in Obba for Excel. Build-in utility classes to dynamically instantiate an object from a Java source code string from the spreadsheet. Improved configuration of client and server via property-files (ObbaClient.properties and Obba.properties). Complete rewrite of the spreadsheet add in part for Excel and OpenOffice/LibreOffice. Obba server, i.e., the JVM, now running in separate process. Obba server may be launched with custom arguments. Client/Server support: Obba server process may run on different machine. Added features for developers to allow bundling of Obba with your own sheets and JARs and/or white labeling. See the Obba developer page. Complete rewrite of Obba logging giving you better diagnostic output. Log window accessible from the Obba Control Panel. New features like easier instantiation of Java arrays and access to Java arrays. Visualization of the object (implicit) dependency graph. Visualizes object and the arguments used to create them. Better handling of transient object labels. Obba no longer needs administrator privileges. It is installed in a user-specific location (%APPDATA%\Obba). The developer documentation provides instructions on how to bundle Obba with your application (i.e., how to build your own installer). This includes automatic installation of a registration code. Obba for OpenOffice handles 10000 spreadsheet function calls (e.g., object instantiation (obMake), method invocation (obCall), or result conversion (obGet)) in 4 seconds on a 2.5 GHz Intel i5. On a multi-core architecture control panel (with GUI updates) and logging do not affect the performance since they run in their own thread. Obba for Excel is a bit slower overall. Please send feedback and feature requests to info@obba.info.